With the increase in technological gadgets, the need to upgrade at each level has almost become imperative. If you have a phone then you need to move on to a smartphone that is going to offer you a lot more other features and facilities. These days the availability of a smart device is no more a luxury but a necessity. Hence you are required to have the best of services at hand so that you can manage your office presentation while being in the car and also fix up an after party with the help of a simple venue booking through a single click. Now with the ongoing nature of these services, everybody from 12 year olds to people in their early 60’s are roaming around with smartphones. With this, there is an urgent need to keep a track of what people are doing. This is precisely because with the increase of cybercrime, users often end up getting into a lot of trouble. Similarly if you are running an office, you need to keep a check on employees. Hence the requirement of a phone tracker is imperative and this is what Hoverwatch brings forward. Usually most such software found in the market are sms trackers or are typically focussed on one single aspect, but Hoverwatch on the other hand is a complete package offering several services. This serves as an ideal way for you to keep a check on your children and even office employees, without them even knowing. 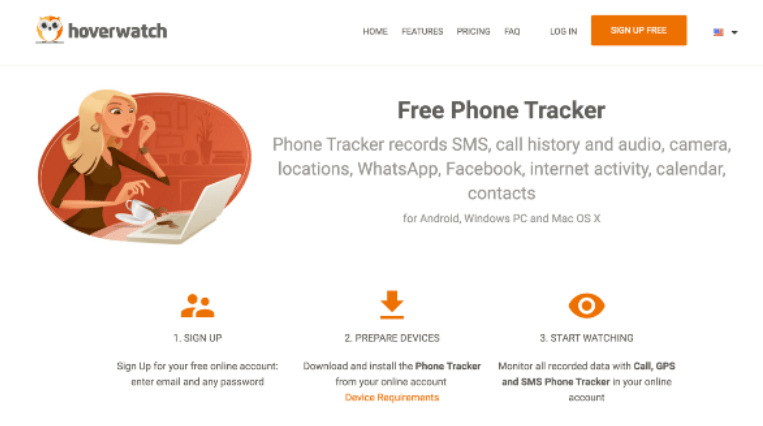 The first factor that makes this phone tracker an ideal one is because it is compatible with Android, PC and Mac as well. The first step is to sign up for the account by entering your email and password. Once the account has been created, you can download the tracker and finally start spying the device that you want. However do make sure that you have direct access to the device in order to download and install Hoverwatch in the same. It also needs to have an internet connection so that data can be sent to you. One of the factors of great reliability is that this tracker has been working for nearly 6 years and has been reportedly installed in millions of devices. What makes this phone tracker really usable is its hidden feature. The target device will never realise that all data is being sent over to an online account and is being scrutinised by someone. Therefore it is safe and if you are the one to spy, then this tracking application can be a real saviour. Text messages and calls are the two vital elements through which you can be constantly updated on what the device user is up to. Any messages sent or received and the entire call history will be reordered and provided to you in your personal dashboard account. Considering that Facebook and Whatsapp are the most used mediums of digital social interactions, there is also a need to track these effectively. Hoverwatch is quite an expert in making videos, audios and photos shared in these platforms available to you. Sim card changes are getting pretty common and with Hoverwatch you can actually keep a track of every time the user removes the sim card. The front camera feature is quite unique. Whenever the screen is unlocked, an image of the user is clicked and sent over to the control dashboard. Location tracking through GPS is made possible and with this you can be completely aware of where the user and phone is and at what time. 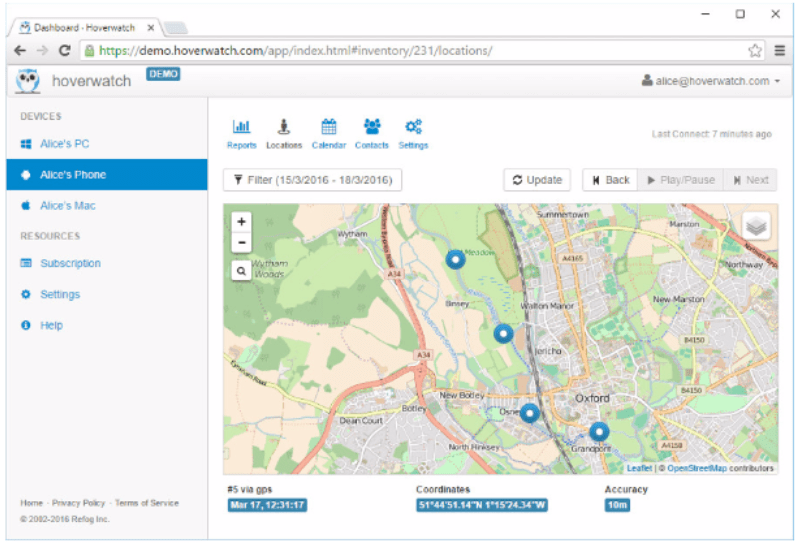 The feature that makes Hoverwatch a more than average investment is that using all these features you can even track the device if you have misplaced it, left it somewhere by mistake or even if it has been stolen. Hence it is an overall tracker for every purpose you need. Hoverwatch is available for both family and personal uses. The rates differ with each plan and sector and for the former plan you can track up to 5 devices at the same time. Hoverwatch is really one of a kind because of the excellent spying features and the ability to record everything and sending it over to the user account dashboard. It is effective in keeping up its promises of reliable and safe tracking. It is a complete tracker and does not hinder the device that it has been installed. Hence everyone can continue with their work, without being constantly hovered on. Hoverwatch works out effectively for those parents and employers who want to keep a close eye on the people concerned.